It was Friday 11th January, around 2pm. Andrew, Debbie, Adam, Louisa Goodfellow and ‘newby’ Molly Davies were in the Rose and Crown. Aware the quiz was imminent, we had also ‘trapped’ local head chef from Gees Restaurant, Russell Healey, to help us. 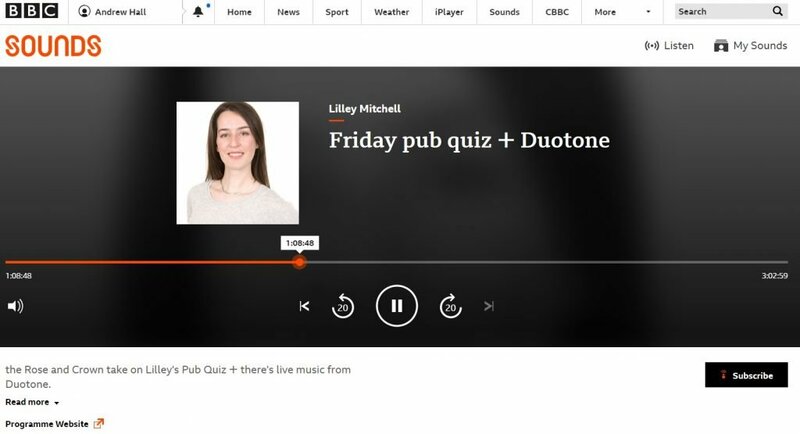 Before you scroll down to ‘Listen Again’ on Radio Oxford, try the questions yourself. 1. What did the Queen and President Mitterand of France open on 6th May, 1994? 2. Which British experimental pop band had albums entitled “A Night At The Opera” and “A Day At The Races”? 3. Which Oxfordshire town is generally regarded as the gateway to the Cotswolds? 4. Which team knocked England out of the world cup last year? 5. Which 2001 Baz Luhrmann film sees Ewan McGregor fall in love with a cabaret actress played by Nicole Kidman? 6. Who chaired “Question Time” for the very first time last night (Thursday, 10 JAN ’19]? 7. Which green vegetable is served with ‘Eggs Florentine’? Many thanks to BBC Radio Oxford journalist Galya Dimitrova, who was so helpful in coordinating our contribution to Lilley’s show. Thank you Galya. We would like to thank Louisa Goodfellow for the loan of her very modern Ipad telephone WITH speaker, enabling everyone in the room to listen to the questions simultaneously. Thank you Louisa. How did you do with the questions? 7 out of 7, eh? You’d better drop me a line before December! Our answers (aka the magnificent seven) resulted in Lilley awarding us a “full public house“.